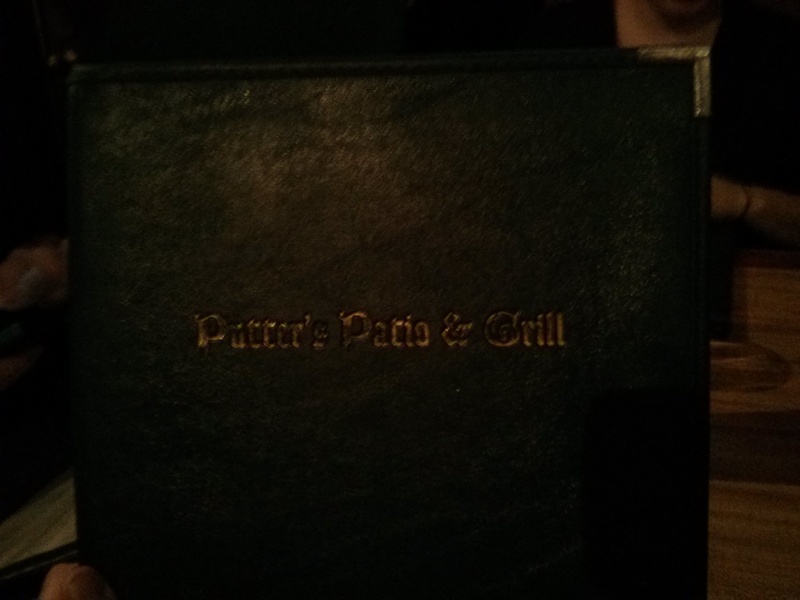 i know it’s dark, but i promise it says putters patio and grill. last week and this week have me traveling to winston-salem, nc for a client. hello, tar heel state! although it isn’t the shortest drive up 85, it isn’t so far to keep me from visiting. the client is amiable and the work is straightforward, a nice change of pace from the complex projects i sometimes have to handle. with a new city comes new adventures, and as you could expect, i couldn’t help myself from trying some local eateries. last wednesday was the first wednesday of the year, and even though i couldn’t celebrate nrw back in atlanta, that didn’t stop me from celebrating it here in winston-salem at putters patio and grill. greg and i had some time to kill before the duke-wake forest basketball game, so we met up with jamie, kalyn, and jennifer at putters for dinner, a recommendation by greg’s friend will. will is now a senior at wake forest, which means that all his years of restaurant trial and error were working to our advantage. although there was a little bit of a wait, i didn’t mind, as there was no way i was eating on their covered and heated patio. it was, i think, 16 degrees outside, but with the wind chill it felt like 1 or 2. ha, no thank you! i’ll gladly take an inside table. we were soon led to the back of the restaurant, cozied up in a booth alongside the locals. 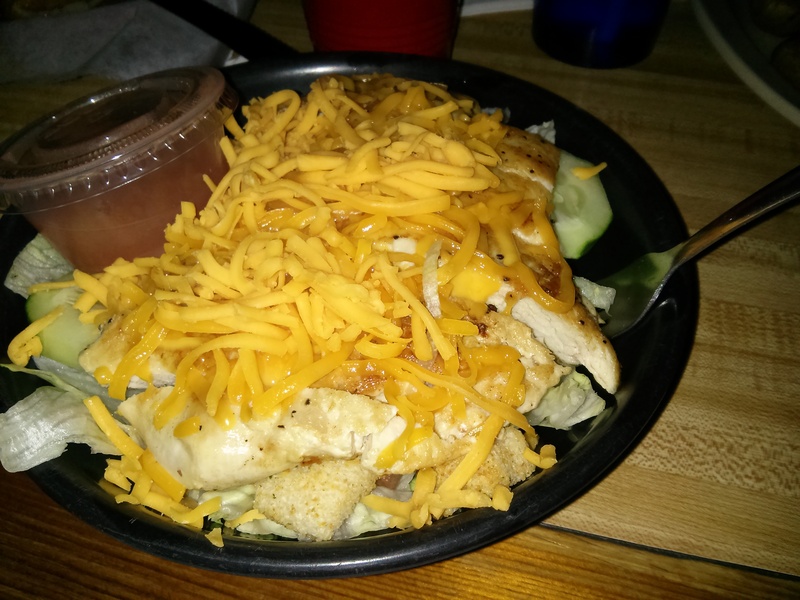 putters is right near the wake forest campus and is across from the ljvm coliseum. it definitely seems to be a spot loved by the winston-salmers, -salemites? you know, i’m not sure what the right word is here, but you get where i’m going with it! they’ve been serving up a delicious and varietal menu to its hungry and loyal customers since 1995. ask anyone in town, though, and they’ll tell you that putters is known for its steaks. none of us were that hungry that night, but don’t get me wrong. i was ready for some eatin’! i was also ready for a little drinking (to no one’s surprise) and had the winter solstice because it was so drinkable and so cold and so malty, perfect considering the weather. the first one came out in a pint glass. pretty standard. the second one, though, was served in a solo cup…because they were out of glasses…oh, putters! look at that demon deacon! for eats, greg got us started off with an order of the calamari. it was nice and peppery and paired well with the thick marinara sauce that we were all fond of that night. to quote kalyn, it was “very fried” in the best of ways, and greg even personally gave it a 4 out of 5.
i know, this photo is super grainy. 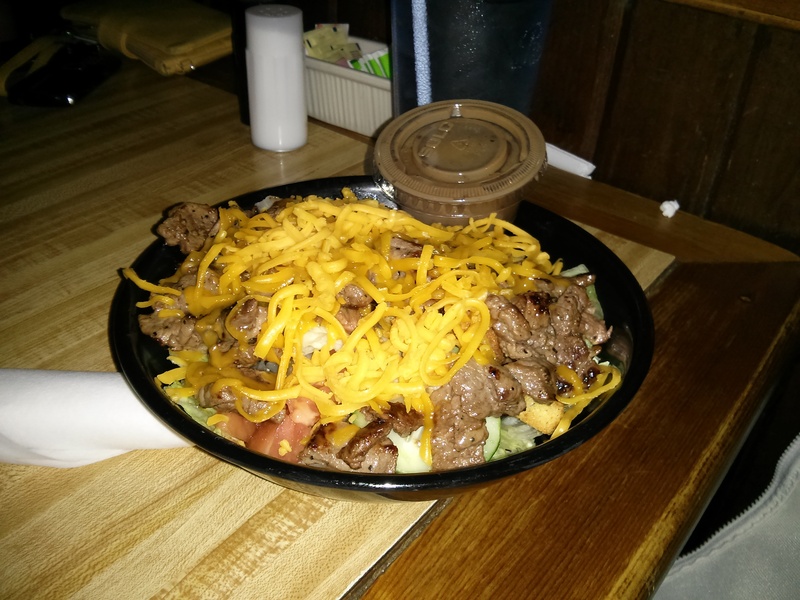 jamie took the healthier route with the steak salad that night. she told me it was great, just what she was wanting. however, she does wish there had been a bit more romaine – there was just too much iceberg lettuce in there for her liking! 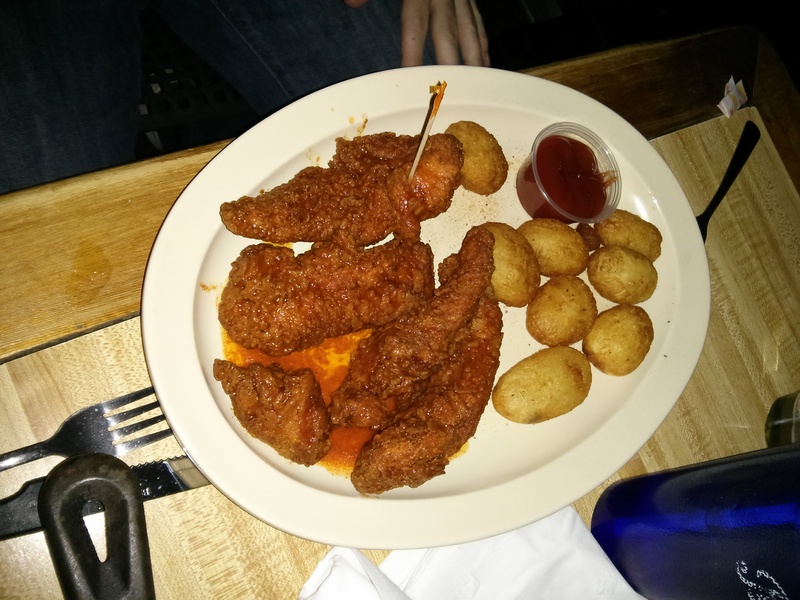 for dinner greg ordered the buffalo chicken tenders in medium sauce. those things just looked spicy, and greg said they were phenomenal. now, he’s not sure if it’s because he was so hungry or if it was because the dish was that delicious, but either way, he devoured the whole plateful. 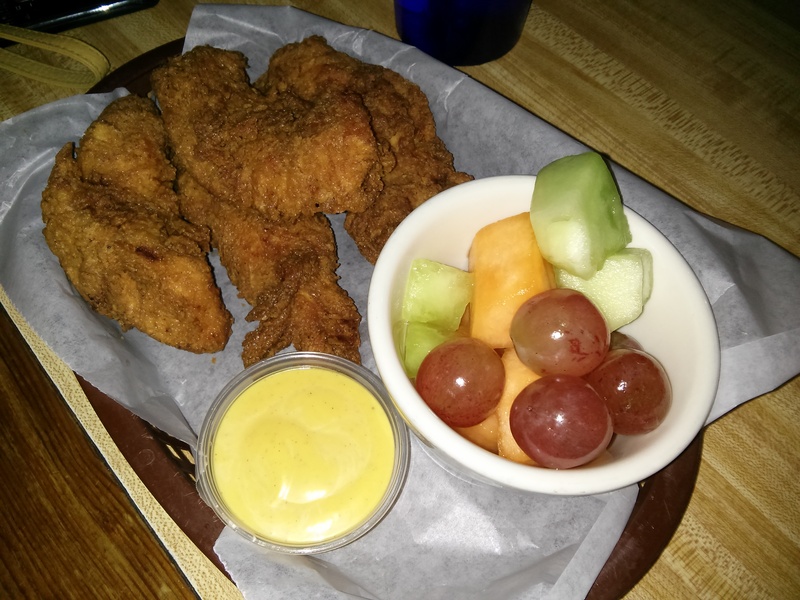 jennifer kept things simple with the chicken tenders and fruit cup. the chicken itself was moist, but its skin was dry. the honey mustard was clearly straight up out of a bottle, and besides that, there wasn’t much else to say. we then come to kalyn who had the lemon pepper chicken salad. it was deceptively large and very layered. the review was that it was “fine” and perfectly pleasing but not something that would blow you away. i think we decided the word “content” could best be used here. ah, le sigh! now, when i get ultra hungry, i tend to order whatever on the menu catches my eye, so that night i ordered an entree and an entire appetizer, even though we were already being served our meals. 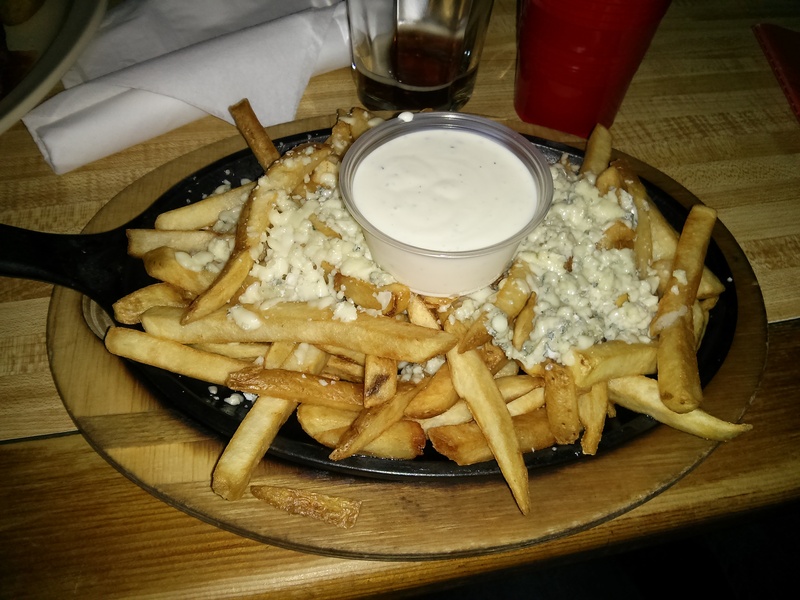 i mean, how can you say no to gorgonzola blue cheese fries? that’s right, you can’t, and i didn’t. that skillet came out, and i knew i was in for a treat. these bad boys were supa cheesy, instantly taking me back to my college days when all i did was dip french fries in ranch dressing and binge on dining hall specials. but hey, maybe that’s because i was on a college campus. it almost might be because i was rockin’ my wake forest t-shirt. whatever the reason, these fries were the stuff. what did i have to accompany my fries? 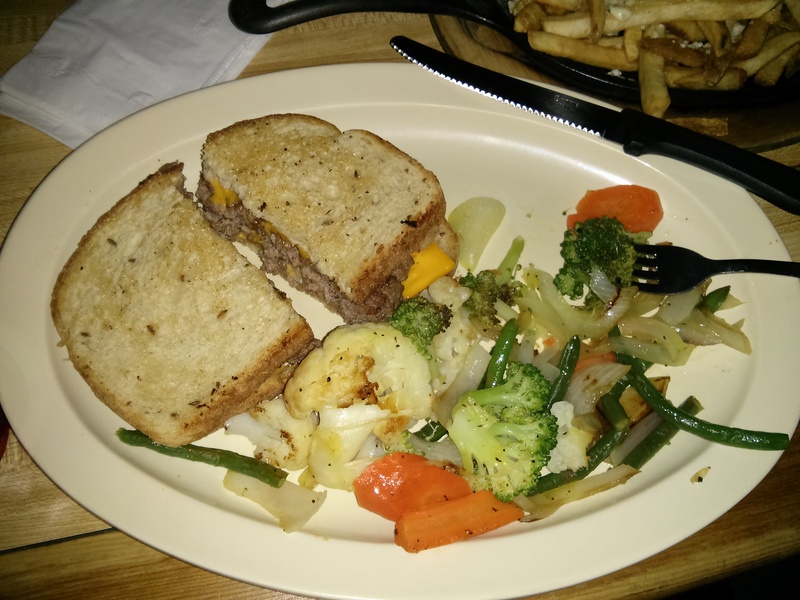 i went with the patty melt, because my goodness, it sounded like the best dang thing on the menu at that moment. to quote myself, it was “real good.” the patty was cooked well and was nice and greasy with all that cheese squeezed between two pieces of rye bread. oh, and i suppose i should acknowledge the mixed veggies on my plate, for they weren’t too bad either. putters was a great pre-game stop that wednesday night. it certainly feels “dive-y” but in a way that you still feel like part of the crowd even if you aren’t a local. i certainly could picture myself coming back here, especially to watch a sporting event. but that night? that night we were watching the event live, for we dashed across university parkway and cheered on the demon deacons against the blue devils. they put up a good fight, but the number two seed walked away with a victory in the end. hey, at least i got a sweet koozie and t-shirt out of it. go deacs!